MOTHER MARY: Yes, it is me, Mother Mary, and I would like you to use what you have written last night with Archangel Faith and your Ascended Twin Flame André, as being a teaching from my heart, a teaching that I support and could not have put in better words. I especially like your historical research concerning Constantine’s alteration of my son’s original teachings. He turned it into a doctrine with despicable connotations of a sacrifice on the cross being necessary for the salvation of mankind, when the potential is within your heart. It is the threefold flame, your connection with your I AM. It is that image of Christ that you mirror into the matter world. You have it within you. My son did not have to die on a cross for the sins of mankind. Those so-called sins in the garden of Eden were a misuse of power that caused the downfall of Atlantis. That episode of history is told in Genesis. All of that section concerning the Old World before the Flood relates to the Atlantean era. That misuse of the Light resulted with a karmic debt that had to be balanced, or repaid. You have the tools the Ascended Masters have provided to make this repayment, to bring the world through the process of Ascension. It is part of it. One Master dying on a cross, shedding his blood, is not a sacrifice that could repay this karma, this misuse of energy. Mankind still has to go through a long process of transformation, at the core of its psyche, to ascend to higher consciousness. What was achieved by my son was his own Ascension. And also he provided a balance of Light in the world by his presence, in the company of the souls that had come into embodiment to work with him. It was as it is today. You provide a new paradigm of being, just by being present and by seeking to fulfill your own destiny in alignment with the Will of God. My son, Ieshoua ben Joseph, Issa, or Jesus, actually did not die on a cross. He was not even put on a cross. The Gnostics knew this. You can imagine it is a very delicate and controversial subject. The Templars also knew this. They didn’t reject Christ but Constantine’s doctrine because it was devised for the control of the masses. Sacrifice was typically Roman. Just know this for the time being, as it is not possible to expand on this subject in this dictation. Know that there is a true teaching hidden in the Scriptures. It is esoteric. It requires interpretation. Jesus taught the principle of Reincarnation during his life 2,000 years ago. It has been removed from the New Testament. He went to India and Tibet, and was educated in the blessed Isles of Britain by Druids. I moved to Avalon with Joseph of Arimathea and built a wattle church in that place called Glastonbury. I just wanted to mention a few words about this. It is true that some of the ancient kings of Britain were descendants of Arimathea. To come back to the subject being discussed, the spirituality that should have manifested in the timelines following our presence on Earth 2,000 years ago, was impeded, obstructed. The negative forces created a system of belief appearing to be a religion, but behind its bright façade was a very subtle instrument of deception, the doctrine of atonement, this sacrifice on the cross. Furthermore, insisting on the exclusive nature of its revelation, or the uniqueness of Christ as the Only Son of God, the Roman Church raised Jesus upon a pedestal of worship corresponding to Roman idolatry. Millions of people are blind to this fact today. They insisted he should be worshipped in order for mankind to gain the glory of paradise, but only after death. Faith and commitment to the doctrine had to be blind. It is interesting that there is such an expression as ‘blind faith’. And Archangel Faith has repeated many times to you that her name should relate to a Perception of Truth that Archangel Michael defends, not that blind faith of Christian beliefs that have permitted the tradition concerning Archangel Michael to be preserved. Blind Faith is a human belief that does not involve the Third Eye chakra. We shall return to this later. Church fathers of the 4th century AD hid the existence of evil in their own time with a theological interpretation of Antichrist appearing in the future when it should have been plainly visible it already was around. All of these erroneous notions are a problem today. They produce a convoluted logic which leads to fears where the question of the extraterrestrial presence is concerned. Hearing about this fact, some Christians, most of the time Evangelical, state that any Aliens must be ‘fallen angels’. They do not know about the presence of our Galactic family which has been well hidden. But, dear ones, the fallen angels are among you. I have explained this in my message entitled ‘Sword of Blue Flame/Maldek’. It was because the souls of Maldek were allowed to incarnate upon planet earth that Archangel Michael fashioned his sword of blue flame. It was because he knew that they would reconstruct the reality which had destroyed their planet. He could see that many would become prisoners of their reality and of the shackles of their own creations. So the priests of the late Lemurian era were approached and asked to cooperate to create a mystery school to keep souls upon the path of righteousness as well as Ascension. There is no returning of negative entities with Nibiru to precipitate an apocalypse, or end of times. The book of Revelation does state that Michael did cast out the dragon, the symbol of the dark forces that have enslaved mankind. He cast it on Earth. This means they were incarnated. I am referring to the souls of Maldek. They rose to power and created the Atlantean empire. They have used strategies, controlled your mind, by limiting your access to knowledge in modern time, so that you, physical angels and Star seeds, or saints who were not defiled – and I don’t mean those laggards of Maldek – would not know, or remember, who you really are after you have reincarnated. They have imposed their hegemony over the education system to achieve this and have brainwashed unsuspecting souls and the innocents, with many parallel methods leading to a state of chaos in the whole world. Such was their work. This is why Disclosure is the great Event that is about to unfold. It will disclose the suppression of Truth. It has already started as the truth has been exposed about different categories of subjects, one by one in the mainstream media. A replacement in governance of that Nation – which was destined to be an example of democracy, and instead has been infiltrated down to its core and leadership by the forces of darkness – is shortly to take place. Following this a phase of disclosure will begin with the scandalous matter of betrayal related to 9/11. I am Mother Mary, confirming to Christine that this notion is correct. She takes my dictation and doesn’t know what is coming next. But while listening to one of Donald Trump’s speeches recently, something he said made her suspect that Archangel Gabriel’s last announcement concerning a disclosure may have been related to that subject of 9/11. Some ideas concerning a disclosure on that subject have spread many years ago, but in the mainstream media this is still regarded as a conspiracy theory. However, of course, if a new President – one who, by the way, needs to be extremely resilient, dynamic and vigorous, to be able to oppose the Establishment – if that one told you that 9/11 was an ‘inside job’ to create an enemy, create the idea of terrorism, to serve the mechanism of the war industries, the number of doubting Thomas would drop sharply. And I am now revealing, as Christine is noting word for word, in this method of dictation, that Archangel Gabriel’s announcement alluded to this particular topic. We are entering a phase of Disclosure entailing a complete dismantling of the various systems of thought created by the powers of darkness in recent decades. These were also built upon the legacy inherited during thousands of years of slavery under the Anunnaki. I am referring to the system that has kept you in ignorance and darkness. It is a system that allowed academics and researchers to accumulate a wealth of data and knowledge but within the box of the exoteric confines. I will leave you to a study concerning the connection between your third eye vision and the creation of your Reality, as well as the precipitation of abundance, which does tie in with the unfoldment, on this timeline, of revelations and disclosure that will change you, that will heal and restore your physical bodies, that will bring you enlightenment, and abundance for a period of transition in which you are recreating a golden Age civilization, a new Gaia. You can start working with this and later you will benefit from being taken to light chambers in physicality. This is already happening but when you are out of the body. During this time you will continue to rise in consciousness upon a spiritual path that give you the pleasures of a relationship with your Higher Selves and your Elder brothers and sisters of the Stars. You are spiritualizing the world. What follows is also about my Immaculate Heart. From my heart now flows the love of the Mother to your own. Namaste my children! CHRISTINE: I have asked Mother Mary about the Holy Grail which some researchers have linked to the idea that Joseph of Arimathea collected the blood of Christ into it. The answer was that the Grail was an esoteric symbol and an association with the blood of Christ is to do with the quantum DNA at Christ level that is being projected upon the fabric of the human being. It was a cup of Light representing the Higher Self, or Christ Self, and the cup itself represents the soul in incarnation seeking to integrate with this higher consciousness. Being esoteric, this truth has suffered deterioration. CHRISTINE (with André): The Elohim of the 5th Ray is Mighty Cyclopea and His divine complement is Mighty Virginia. The Archangels on the 5th Ray are Archangel Raphael and Mother Mary. The Chohan is the Master Hilarion. Jesus Christ apparently stated that if your Eye is Full of Light, your body will also be full of light. It means that if the Eye Chakra, or Third Eye, is purified, we will be raised up and will get the Vision that is ours’ in Christ consciousness. Mighty Cyclopea can purify our vision and it is by that vision that we can manifest a better Reality. If we use the power of the spoken word and the spiritual tools provided by the Ascended Master, if we connect and visualize, the entire Spirit of the Great White Brotherhood, the Archangels, as well as all of Heaven, will work through us, and use us to act in the world. We can ask for a solution to a personal or global problem to permit Heaven to intervene and manifest an aspect of itself in our reality and our world. Archangel Raphael and Mother Mary provide healing on the 5th Ray with the green and emerald aspects of the Light of God. They work with the Third Eye Chakra. Their Ray is also in connection with Truth and therefore Disclosure. At this time, there is an astrological portent precipitating a great disclosure in regards the many truths that have been suppressed by the temporal powers of the world. They have done this to serve their secret agenda of control. Archangel Raphael and Mother Mary bring healing to the people and the nations by consecrating them to their immaculate designs. They create a white fire core in the shape of a sphere, surrounded by a blue sphere of Light containing the Will of God which is the perfect manifestation of Reality for all mankind. And they surround those two spheres by another sphere which is a healing substance. So, call for your healing in order to make the call compel an answer. The material world has been distorted by its misuse of power and energy. This reality will not continue if your higher Self commands the return to a manifestation which is the result of an Immaculate Conception. This is a Conception in the sense of your Vision through your Eye Chakra, which Jesus said should be full of Light and pure. When you hold an immaculate frame of mind, you give birth to Christ consciousness, and this is in the sense of the second coming of Christ in mankind. It takes place as a result of the manifestation of the Son of God, the Christ Self. That pure archetype, or Blueprint, is an image related to the higher DNA, which you then mirror and express in the external world with your virtues and righteousness, as well as all the qualities you can attract from the Divine Rays of Light. This perfection exists with your Higher Self, or Higher Mental Body, and you are integrating these attributes. By calling Archangel Raphael and Mother Mary, as well as the Elohim Cyclopea and Virginia, you can gain access to a healing thought form of spheres within spheres relating to perfection and an immaculate blueprint to manifest your freedom from ailments, diseases and death. When ready for ascension and going through the portals of the third phase of this Wave of Ascension, you will already have been imbued with the Twin Pillars of consciousness of High Beings such as the Elohim, Archangels, Ascended Masters, as well as the Higher Self of your Twin Flame, or your Ascended Twin Flame. You will already have been wedded to Christ consciousness, by the Solar Ring, and dressed in the wedding garment that is the golden Solar garment of Ascension. So there are two symbols involved with what is presently taking place: the birth of Christ consciousness seen as a Second coming of Christ, which is also mentioned in the Book Revelation as the birth of a Manchild from a Woman in Heaven. It is the collective soul of mankind going through a labor of birth. This woman is attacked by a Dragon representing the forces of darkness that are still at work on the astral plane, and on a part of the 4th dimension. A battle is going on and it’s an Armageddon of the psyche from which this Woman is delivered thanks to the action of the Prince of Heaven, the Defender in battle, Archangel Michael of the Blue Ray with his heavenly legions. The Woman, mankind, finally gives birth to the Manchild, a symbol of Christ consciousness. You know that the description relates to changes as a result of the presence of the Solar System in a Photon Belt, as well as to a mutation of mankind’s DNA, which is also the result of the descent of the Light Body, this Christic, or Buddhic, or simply higher consciousness. The raising of vibration and raising of the powers of Kundalini from the base of the spine, the Seat of the Soul Chakra, also play a part in this. A liberation is taking place but it has been compared to child birth. The second symbolic imagery is related to this reconnection through the Solar Ring to the Higher Self, and the Mighty I AM Presence. The connection was there in the secret chamber of the Heart, where is anchored the Eighth Ray, as a threefold flame, but ever so tiny in mankind. It has been magnified by the action of turning one’s eyes to the Inner Self, of introspection, and the seeking of answers, as we have sought Truth and placed our feet upon a spiritual Path which we have actually become. We have to integrate with the one we really are, in the core of being, and it is a relationship that takes us there. ANDRE: We are trying to restore the world, and even the whole Universe to what it was intended to be, and we have changed the future by going back into the past. Jumping timelines and erasing, with the Sacred Fire, as well as the Violet Flame, what was never intended to be. There never was any Will of God, to cause the world to sink so low into duality, with the suffering it has entailed. With regard to the immaculate aspect of the Mother of the World, Mother Mary embodies this Feminine Principle. She was appointed in the office of this embodiment of qualities but we are all also embodying the feminine principles. She was already called the Virgin Mary in her incarnation as the Mother of Jesus, but this alludes to the purity of her soul. She is in that office in the Great White Brotherhood. It is beneficial to repeat the Hail Mary prayer, even though it is from the Catholic Church, because of the momentum it has attracted, but change the last sentences so you state: ‘Pray for us, sons and daughters of God, now and at the hour of our Ascension in the Light’ because you are not sinners. 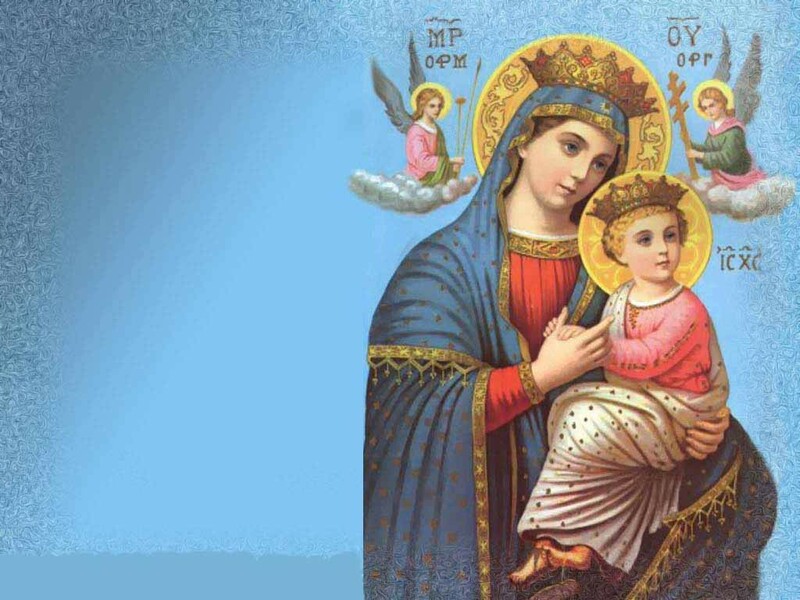 CHRISTINE: The reason Mother Mary is called the ‘Mother of God’ is that it is a Catholic prayer. On the basis of my research I can say that Catholics believe that Jesus Christ was the Only Son of God, despite the fact that the Word mentioned at the beginning of the Gospel of John, which was translated from LOGOS in the Greek language, is a statement about the existence of a Universal Christ Consciousness that existed from the beginning and that was that Son of God. So I suppose the Church fathers who defined the Christian doctrine chose to believe that only Jesus Christ could integrate with this consciousness, but they have missed out on what his teachings were about, why they were a ‘good news’, simply that mankind also had this sonship as a potential of salvation. Catholics, as well as other Christian denominations, derive their faith from a doctrine which was devised by the Roman Emperor, Constantine the Great. He convoked some bishops from the movement, which had taken shape during the previous two centuries, to attend a Council at Nicaea in 325 AD. Prior to this there had been debates between a group called ‘Apologists’ and the Gnostics, as well as another group with a theological interpretation called ‘Arianism’. It was claimed that Christianity was chosen to be Constantine’s State Religion, but it did not exist yet because the bishops who were invited to attend the Council of Nicaea were all Gnostics! The fact that these bishops refused to accept Constantine’s doctrine has been recorded because they were threatened with exile to ILLARYA, an island. This is recorded in the Pre and Post-Nicene Records, large volumes which are available to the public. Two bishops were actually exiled there. Some texts were copied from existing records and attached together. They were included in the gospels. Some were called apocryphal and were not included in the official canon of scriptures. Many of the original books were destroyed. The Old Testament had already been translated from Hebrew into Greek about three centuries before Jesus incarnated. The texts are called the Septuagint. Translators, beginning with Jerome, were entrusted with their translation into Latin, as well. Then much later after the invention of the press, or printing machine, those texts were distributed in Latin, and closing up to the Renaissance period, the people who translated those texts in their own language such as German and English, risked being burned at the stake. However, the stories were tampered with in the early days of the Roman Empire. The manipulation was directed from the astral plane. It was to keep mankind enslaved with a Vision and knowledge that avoided the ESOTERIC interpretation at all cost. Yet the fiery bush of Exodus had stated to Moses he was I AM THAT I AM. This meant I AM that core of being in you. The VISION of the Sons and Daughters of God was severely restricted for centuries and some two millennia. It was a conspiracy of the dark forces to prevent the lightbearers from knowing who they were. Some odd expressions, such as the ‘immaculate conception’ or the ‘Virgin Mary’ were not removed. They were interpreted literally within the framework of exoteric teachings. Mighty Cyclopea is represented as an Eye, just like the Egyptians represented the Eye of Horus. Reality is holographic. We create it. We are told that we can remove the distortions in our flesh form and mental body by declaring ‘I spell an end to the negative creations which have fueled diseases and a reality that is not a manifestation corresponding to the Divine Will’. Yes, it is like a magic spell. The Almighty Elohim Cyclopea is called the ‘Radiant Eye of Ancient Grace’. The ‘Hail Mary!’ prayer also states that Mary is full of grace. We can also ask for the transmutation by the Violet Flame of mankind’s misuse, during the last 25,860 years, of the All Seeing Eye of God, as well as of the Light of the Emerald Ray. It is by the misuse of the Third Eye Vision that mankind fell into a Reality that was not intended. We have to return to an immaculate concept, or Vision, for which there exists a blueprint. We only have to mirror it within our soul. It is the Cosmic Virgin which Mother Mary embodies. In the past civilization of Atlantis, a misuse of power was also carried out by a black magic method projected through the Third Eye through impure thinking, thought forms, feelings, seeing. They manifested as illusions, delusions, a cloud or veil, that mankind is being stripped of through the process of slow disclosure. We are now entering a phase of Enlightenment. 2016 is the year of Illumination and Enlightenment. Archangel Uriel brings it to us. It is very much related to Disclosure, Teaching, Lord Maitreya, Education, the Master Jesus and Kuthumi, and the Galactic mentors. The Flame of living Truth transforms erroneous concepts, feelings, and manifestations. By the Science of precipitation you can create your perfect health by calling for heaven’s perfection. The Fifth Ray, or Emerald Ray, is also the power you can invoke for the manifestation of supply, prosperity, and a solution to your personal financial problems. But try and give priority to the spiritual path and your relationship with your I AM Presence. The Master Hilarion also is the Chohan who can be called for healing on the 5th Ray. Healing is also one of the Master Jesus’s specialities but his Ray is the Sixth. Where Vision is related to Truth, Pallas Athena is another Lady Master you can call. Saint Germain, Lady Master Quan Yin and Fortuna, the goddess of Supply, also work to create abundant supply and prosperity, to raise mankind into a golden age. Before I close, I would like to add a comment about an idea now circulating on the internet concerning the fact that some personalities are clones of certain ancient ones, such as Akhenaten. They insinuate that the latter’s teachings were dark and that the political personalities alive today, that are clones of these ancient ones, are therefore also dark. To see through this, first of all, if there is any soul at all in a cloned being, it is not the same as the one who was incarnated in the donor of the cells – those that were allegedly used in the cloning procedure. Secondly, Akhenaten attempted to resurrect a teaching that was esoteric. On the Egyptian representation of Akhenaten with Nefertiti and his children, you see a Sun disc and rays of light descending from it. This disc represented the I AM Presence, the Spirit within.